I mostly come up empty handed. This time I managed to “catch” a few animals though. The white tailed deer, before they spotted me and took off. I guess the people on the other side of the trail had some nice shots of this deer with their cameras. 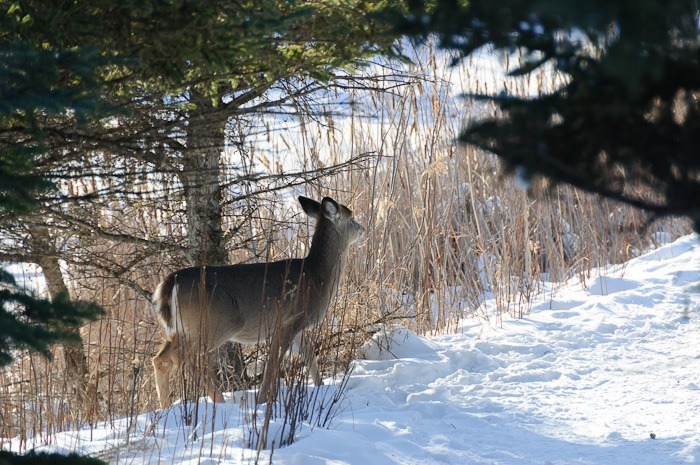 I had the dubitable pleasure of stalking the deer through the woods and startling them. 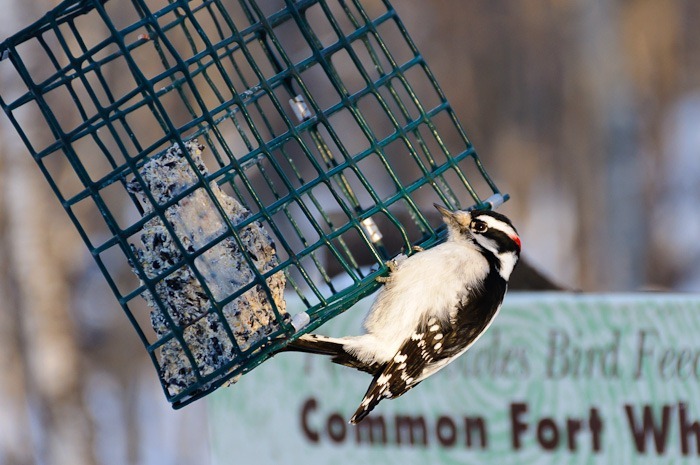 The Downy woodpecker from the lead picture was more occupied with finding food than with me. A good moment to take some pictures. Of the many pictures I took, only a few were good enough to show here. I still have a lot to learn for wildlife photography. One of these things, for a beginner like me in the domain, is to hang out near the feeding stations and keep a low profile over there. With some patience and luck the birds will come and feed without taking notice of me. That was about the extent of my success with the animals. 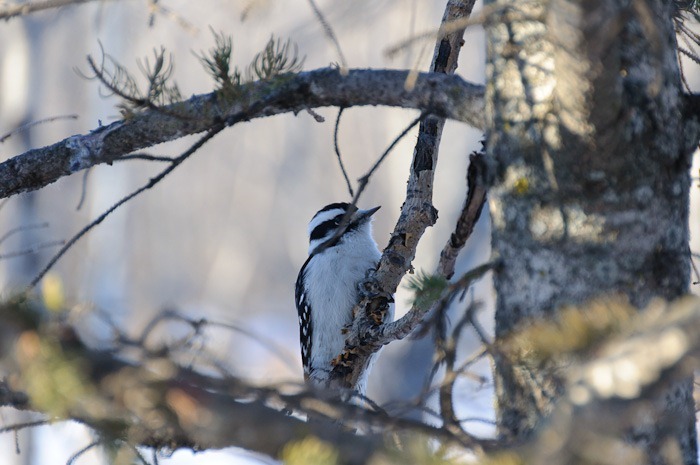 After that, I reverted to my habit of photographing more docile and easier spottable things. 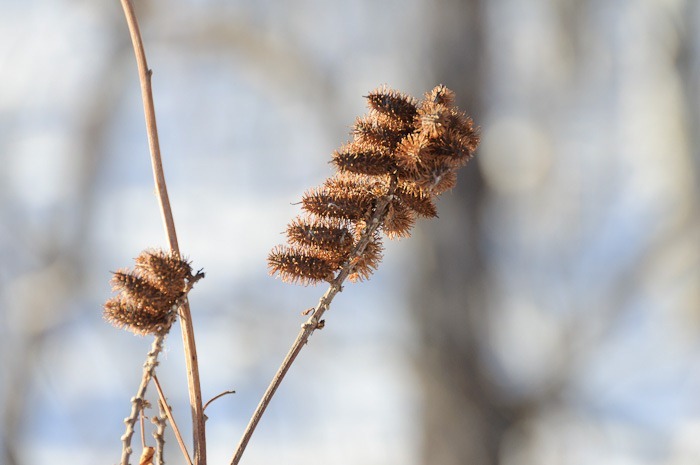 These burs had a nice look with the sunshine from one side. Opening up the aperture nicely blurred the background and isolated the subject. 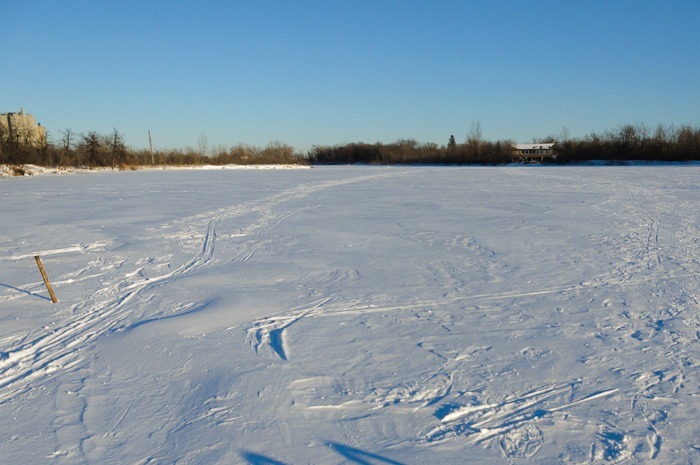 A little view over the lake, some people already tried out their skiing skills here. The way the ice cracked under my feet made me go back to the dock. I guess skis spread out one’s weight better than shoes. 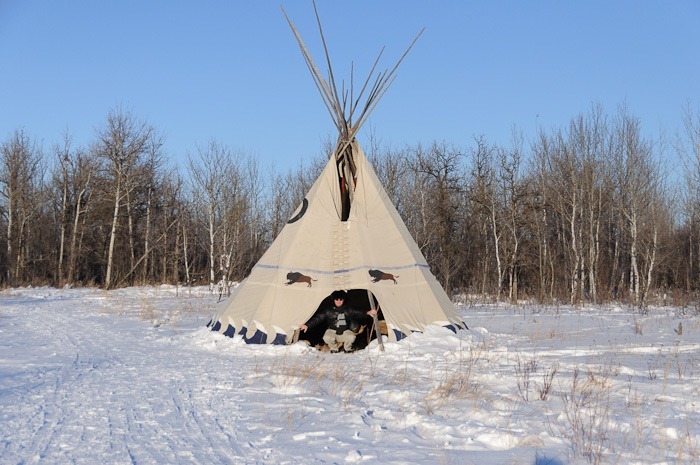 On the grounds of Fort Whyte Alive there are many activities for kids and adults. Telling stories around a fire is definitely one of them. But what better than hearing these stories in a tipi ? So I found a tipi and had my wife take some pictures. The magic of the inside of the tipi depends on one’s imagination. The inside is simply furnished with bales of hay to sit on and a small stone circle for the fire. Definitely not comfortable enough for me to spend the night, stories or no stories. 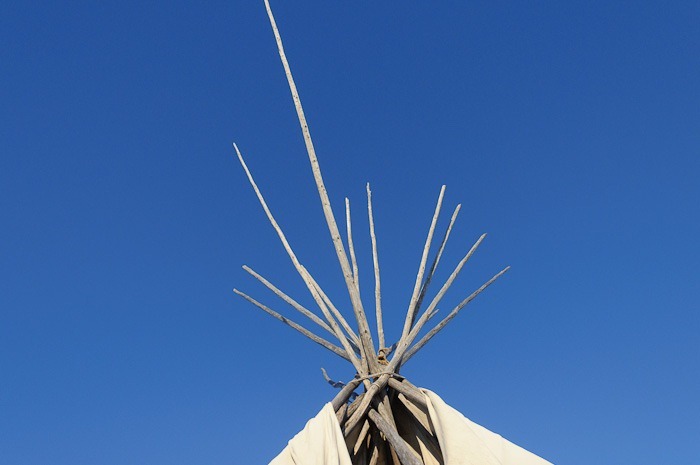 The top of the tipi gave a nice image against the blue sky. The top, isolated from the rest of the tipi looked like a giant coat hanger to me . 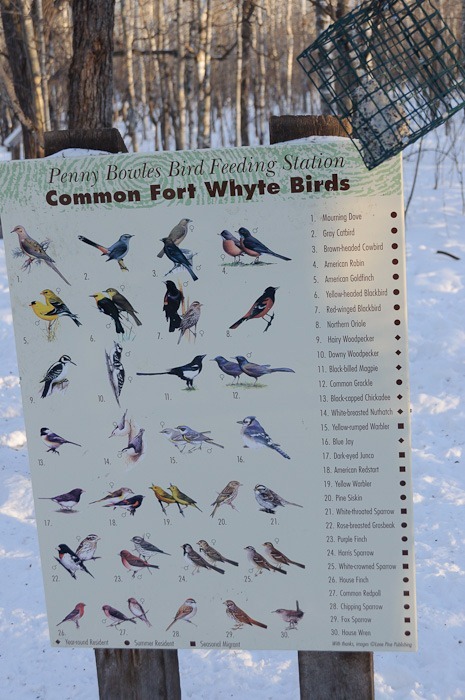 This was a small Sunday afternoon at Fort Whyte Alive. Come to think of it, this is the first post on my blog this year. Ok that was easy, but it is also one year that I have been blogging about all kinds of things in my life. What do you, think, reader ?Should I continue?